Our traditional, stone-built house is centrally situated on the Isle of Berneray, next to the Bays Loch seal colony. 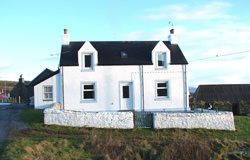 We offer a large and comfortable en-suite family guest room, affording magnificent views out over Bays Loch and the Minch beyond, as well as an en-suite double/twin room which has views towards Borve Hill. We are located within easy walking distance of the beaches, shop, post office and other services. Being just a mile and a half from Berneray's Ardmaree Ferry Terminal, we are particularly well-placed if you are island-hopping. From the family room, or the kitchen where you will take your breakfast, you are virtually guaranteed to enjoy views of seals, as well as herons, oystercatchers and possibly otters which frequent the nearby shoreline. The panoramic view takes in North Uist, Harris, many smaller islands in the Sound of Harris and, on a clear day, the mountains of Skye and the mainland beyond. It is always our aim to provide our guests with the best possible attention and where necessary to 'go the extra mile' to ensure that your stay is a memorable and enjoyable one. Breakfast is served in the spacious family kitchen/dining room at a time of your choosing. We aim to meet most needs with regard to breakfast choices and are happy to tailor the menu to meet your requirements. Whether you require a simple continental-style breakfast or a full Scottish breakfast cooked on our peat-burning Rayburn, we will aim to please. Vegetarian choices are also possible. Round off your breakfast with a freshly-ground filter coffee, cappuccino or espresso. Eating out in North Uist and Benbecula is nowadays a pleasure, with hotels in Lochmaddy (ten miles distant) and further afield. We will be happy to provide further information for you during your stay. During the summer months the Lobster Pot Tearoom at Ardmaree, Berneray, serves soup and light meals, including freshly-caught lobster, between 10am and about 8pm six days a week.